Bob gave me The Essential New York Times Cookbook by Amanda Hesser a few days before Christmas. I know I’ll have a lot of fun exploring the recipes; I love reading the bits of history that Amanda adds to each one. Carrie was home for Christmas and found a cookie recipe that she had to make: Pepper-Cumin Cookies. She was intrigued by the combination of pepper, cumin, lemon zest, and sugar in a cookie so she quickly made a batch. With the help of a food processor, the cookies are a snap to put together. I think you could make them by hand, mixing the dough as you would a pie crust, but I haven’t tried it. Carrie used a mortar and pestle to crack the pepper and the cumin. A quick search online produced another technique. Real Simple suggests using a garlic press to crack seeds, which I thought was a clever idea. So how did we like the Pepper-Cumin Cookies? Carrie and I loved them! They’re quite tender and we enjoyed the interesting combination of flavors. Laura was not as impressed; she didn’t like the cumin in the cookies. 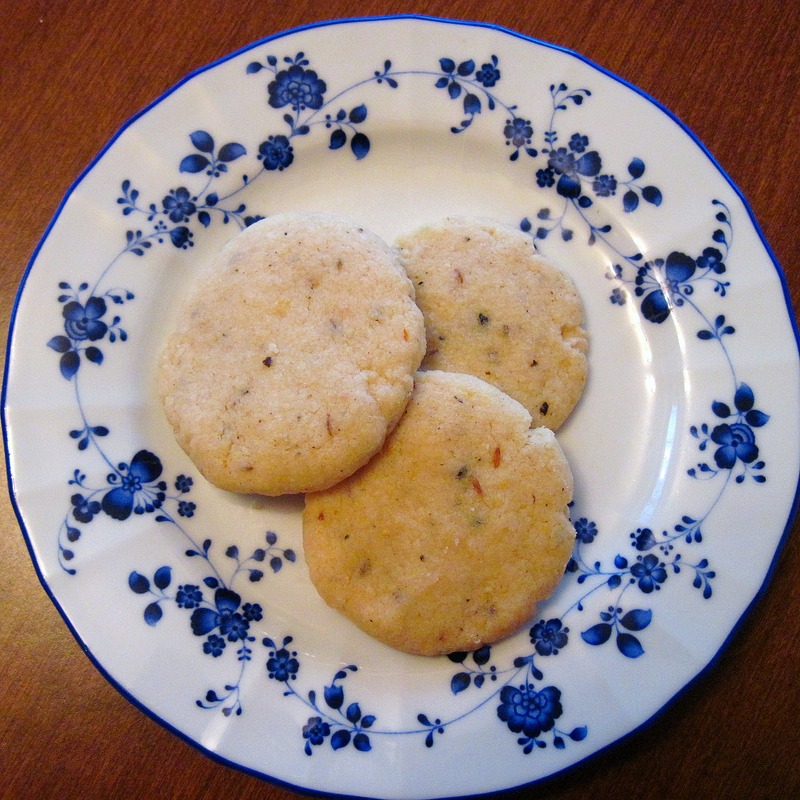 If you are a cumin lover, I encourage you to give Pepper-Cumin Cookies a try. This photo doesn’t do these cookies justice, but I feel lucky to have gotten it. I had to label these last 3 cookies “Do not eat – need photo”! 1. Heat the oven to 350˚. 2. Put the flour, sugar, salt, lemon zest, peppercorns, and cumin seeds in a food processor and process quickly to blend. 3. Add the butter and vanilla and process until the dough forms a ball. 4. 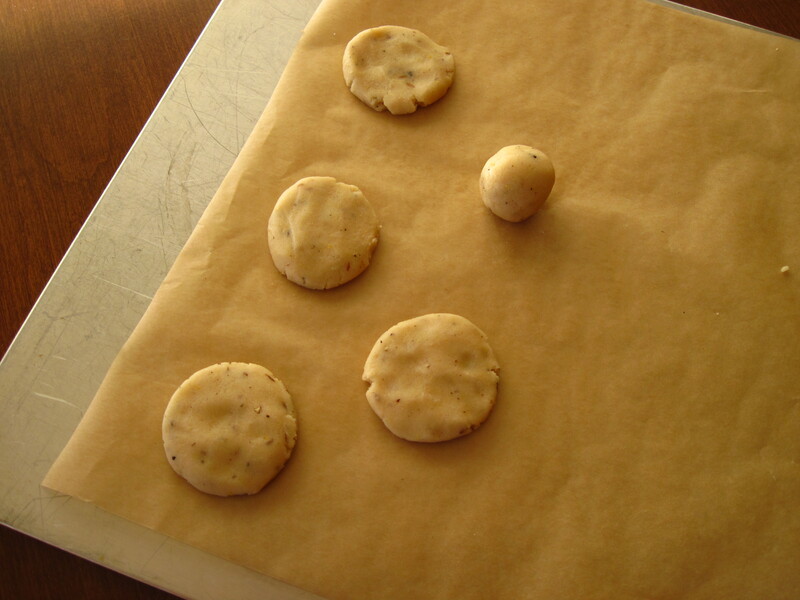 Form the dough into 1-inch balls and put them on 2 parchment-lined baking sheets. Keep them about 2 inches apart and flatten each one so they’re about 1/4-inch thick. 5. Bake for about 15 minutes, until lightly browned. Cool on wire racks. ← Happy New Year and my 1st Blogiversary! What a unique recipe! I would never think to add pepper to cookies, but I love trying unique and original flavor combinations. Thank you for sharing with me all that you do. I wish you many blessings and much joy in the New Year! Thank you, Monet, and I wish you many blessings and joy in the New Year, too! really nice recipe! thanks for sharing i ‘ll try, happy new year! Thanks for giving them a try! Hope you enjoy the rest of the book. happy new year kath! and a happy blogoversary to you too!!!! what a wonderfully unique cookie, I can just imagine the flavors!!! wishing you a splendid new year filled with wonder and joy, God Bless You! Thank you, Jamie! Happy New Year to you! Interesting cookie recipe. Wishing you lots of happiness and peace for the New Year! Thanks, Quay Po! 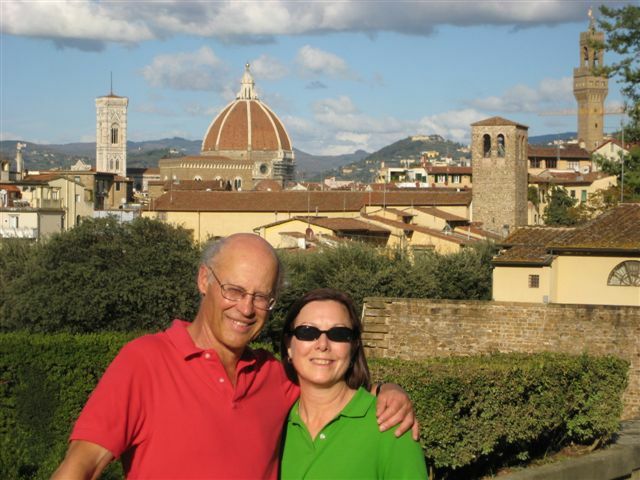 Wishing you all the best in 2011, too!